Our customers keep communicating, as we keep the information flowing! The deregulation of the telecommunications’ market in Greece was initiated on January 1st 2001, giving the option to both the public and companies to choose between telecom operators. The expression of the private will in this sector, under close supervision of the State, led to the blossoming of fixed telephony services, more economical yet qualitatively equal to those of the state telecommunication carrier (OTE). Lannet Communications took a leading role in developing the newly deregulated Greek telecom market, anticipating the needs and requests of its clients, rendering pioneering services and total solutions. Milestones in Lannet’s strategic development were the materialization of interconnecting with the state telecom carrier (OTE) in November 2001 and the agreement of unbundling the Local Loop (LLU). Information, regardless of form, is the “gold” of our times for every company. Its conveyance, presupposes effective bridging of the nodes it passes through. Securing, therefore, a rapid, reliable yet economic form of communication, represents an essential challenge to any company, while – to a lesser degree – a demanding need of each individual. The majority of businesses currently use switchboards for their telecommunication needs supplied by a different company than the one they use for their telecommunication services and a third company for their network infrastructure for the transfer of digital data. This practice proves limiting to development, bearing high maintenance costs and barriers in managing telecommunications and networks. Lannet Communications, timely anticipating this need, pioneers by “bridging” these gaps in conveying the information with unified and open-architecture telecommunication and network solutions in addition to fixed telephony services and transfer of data of crystal clarity. Lannet Communications is a subsidiary of the KLONATEX business group and a member of the Athens Stock Exchange in the telecommunications sector. It was established in 1999, and emerged from what was to become one of the most dynamic markets in Greece – telecommunication services. In fact, it was the first Greek company that materialized its interconnection with the local public telecom carrier (OTE). Lannet is still leading the way in its sector, serving residential and business clients through its privately owned nation-wide network, which it continuously develops and expands with the same interest and care as in the very beginning. 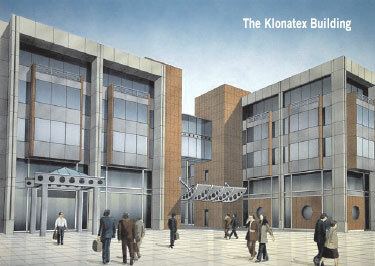 Lantec Communications S.A., also a subsidiary of the KLONATEX business group and a member of the Athens stock exchange, was established in 1981. In its successful course and especially during this last decade, Lantec specialized in providing telecommunication solutions, employing digital call centers and advanced telecom applications. This quickly distinguished the company as one of the most reliable providers of specialized telecom solutions in Greece, with participation in many major projects in the public and private sector. Undoubtedly, the announcement of Lantec’s collaboration with Nortel Networks, a renowned worldwide corporation, was a milestone in the company’s steady path to success. As an exclusive distributor of Nortel solutions in Greece and a provider of telecommunication systems, specializing in the area of Call Centers, Lantec quickly took over a substantial market share, serving hundreds of companies. The vision of combining the potential of these two elite companies inspired the amalgamation: Lannet and Lantec. 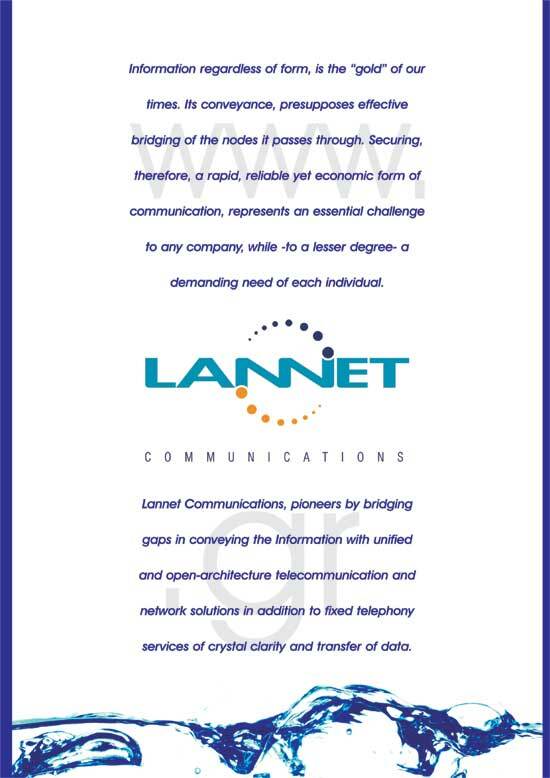 Therefore, in July 2003 the absorption process of Lantec by Lannet Communications began, aiming at creating an even stronger company with a much broader capital base that will truly deliver its promise for total telecommunication and networking solutions. Lannet Communications is currently the only privately-owned Greek company providing Fixed Telephony that appeals to both individuals and businesses, capable of offering voice and data transfer services, providing products and software applications from international telecom & IT houses in order to create and support total solutions of communication for the modern enterprise and individual. On June 30th 2003, and despite the fact that the company was still in the development stage of its business plan, Lannet Communications announced earnings before income tax (positive EBITDA). At the end of the first semester of 2003, Lannet’s share of the whole Greek market of fixed telephony, including the state telecom operator-OTE, modulated to 3,65%, giving the company its leading edge among the rest of the privately-owned companies. At the end of 2003, the number of Lannet clients surpassed 150.000, 14.500 of which were companies. At the same time, Lannet connections went beyond 290.000. Our target is to be able to serve 5% of this market by the end of 2005. Lannet Communications is a company that relies on human capital and technological infrastructure. A refined working environment of high aesthetical standard and functionality was built and is maintained with great care. It is in this atmosphere that creativity flourishes daily. Lannet’s manpower is characterized by a surplus in academic qualifications, with two out of four employees holding a postgraduate or higher degree title and one out of four possessing more than 4 years working experience. It is worth mentioning that the average age of the personnel is 30 years old. Lannet’s second “diamond” is its technological infrastructure – the privately owned nation-wide Telecommunications network of major nodes in the largest Greek cities, plus one hosted in London. The investment for high-tech equipment and business information systems, in the first stage alone surpassed € 30 mil., while the materialization of the second even greater phase, is already in progress and regards the broadening of the current infrastructure, the expansion of the nodes abroad and, last but not least, the development of a wireless network. Lannet Communications quickly differentiated itself in the residential fixed telephony market, by remaining plain and straightforward in its communication and keeping to its promises. The basic service is branded “Lannet 1780” and carries no hidden costs or fine print on back pages. By dialling the prefix 1780 before each call, the residential customer enjoys substantial savings in the telecom bill, quality communication of crystal clarity, complete security of personal data and state-of-the-art customer service. It remains Lannet’s primary concern to constantly enrich this service with additional values. Dial-up Internet services available to our customers, with a choice between PSTN, ISDN and DSL connection is a characteristic example. Lannet, loyal to its principals of transparent processes and reliability, understands and often anticipates its customers’ needs, utilizes the most advanced technology available and, finally, makes “time” be “on your side”. With “Lannet Easy with Pre-Selection”, the customer may speak worry-free, with the certainty of having complete control and reduction of cost as local, long distance, international and fixed-to-mobile calls are charged per second at the most competitive prices. In addition, the residential customer speaks cleverly, since Lannet offers a bonus of free minutes in local calls every month for a whole year. If the choice is “Lannet Easy with Pre-Selection”, all calls are routed automatically to Lannet’s network, from all telephone devices in the household or office, without dialing the prefix 1780. Our customers can count on Lannet because they have full control of the situation as they are sent an itemized bill every month, without flat fees and hidden costs. LANNET Communications offers advanced fixed telephony and Internet services for companies. The benefits can be felt almost immediately when the service that most matches your company’s needs is selected. They promise substantial savings in the telecom bill, crystal clear communication and 24-hour customer support. The “Prime” series of services is offered as a qualitative solution. Our customers are able to transfer voice and data through leased lines in a safe and productive way. Safe because it is a “private” line that does not relate to the state telecommunication network and productive because the full capacity of the communication channel is used exclusively for the company. Finally, virtual private networks unify data and transfer the information through Lannet Communication’s network, connecting subsidiaries, independently of the distance between them, at very low prices. LANNET Communications also delivers direct termination and traditional transit services to operators worldwide, wishing to relay their voice-traffic to a specific destination and vice-versa, thus acting as an intermediary as well. This way it provides the means for the Carrier to plan ahead their international voice traffic by extending their geographical reach without having to invest additional resources or capital. 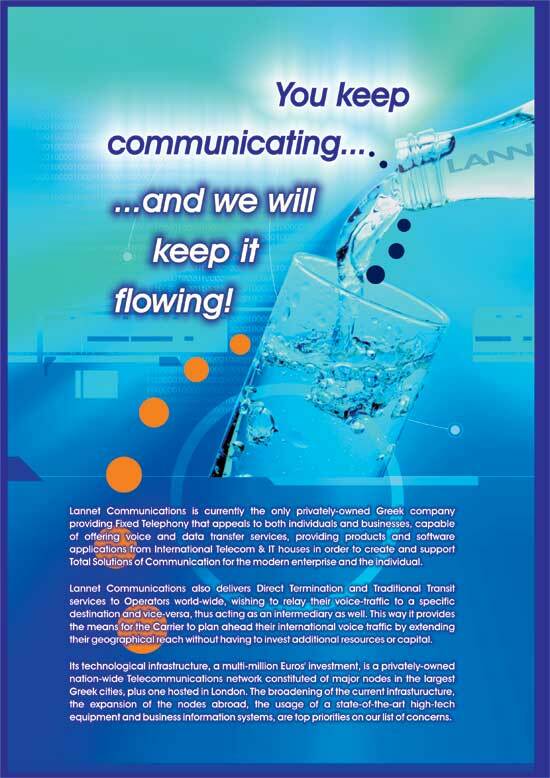 LANNET Communications’ main aim is to support its customers with speed and flexibility. Our customers can call 800-111-1780, free of charge, 24hours a day and 365 days a year to have any queries answered or to receive further information. The trained agents in the customer service department always help willingly in a direct and responsible manner. The customer service department carries out a large part of the everyday connection forms process. This means that the neuralgic nature of the customer service team is active and present from the very first second that someone expresses an interest in one of the many services that Lannet Communications offers.